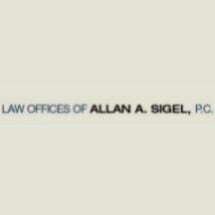 Allan A. Sigel is a well known sole practitioner based in Los Angeles, California. Throughout his extensive career, Mr. Sigel has represented many celebrities and other well known personalities such as Bruce Springsteen, Dudley Moore, Mick Jagger, Richard Gere, Jamie Lee Curtis, June Allison, Senator Alan Cranston, Ed Masry, etc. Mr. Sigel began his career in law focusing mainly on criminal matters, including several death penalty cases. Over the years, Mr. Sigel's practice evolved into a mainly civil practice, involved in complex business and civil litigation matters. Mr. Sigel has successfully tried hundreds of jury trials as lead counsel, resulting in multi-million dollar verdicts. Mr. Sigel was co-counsel in the toxic tort litigation made famous by the movie "Erin Brockovich." Currently, Mr. Sigel devotes a majority of his practice to employment and discrimination matters. Mr. Sigel's firm is AV rated, the highest rating given to attorneys, as rated by other attorneys and judges. In addition, Mr. Sigel has been selected by his peers as one of the "Best Lawyers in Los Angeles" and "Los Angeles Times listed as top rated California Lawyer."